Heat oven to 350°F. Spray 12x8-inch (2-quart) glass baking dish with nonstick cooking spray. Remove stem and seeds from chile. Place chile in small bowl; add just enough boiling water to cover. Let stand 10 minutes or until chile is softened. Remove chile from water; reserve water. Finely chop chile. Melt margarine in large nonstick skillet over medium heat. Add onion and bell pepper; cook and stir 2 minutes. Stir in stuffing mix and chopped chile. Add water to reserved chile water to make 1 cup liquid. Add to stuffing mixture; mix well. Spoon into sprayed baking dish. Sprinkle both sides of pork chops with chili powder and garlic salt. Add to same skillet; cook over medium-high heat for 6 to 8 minutes or until browned on both sides, turning once. Arrange chops over stuffing. Cover with foil. Bake at 350°F. for 20 to 25 minutes or until pork is tender and no longer pink in center. Ancho chiles are dried poblano chiles. Rich and fruity, ancho chiles are the sweetest of the dried chiles. For a spicier dish, add another ancho chile. Use a kitchen scissors to snip the chiles, or use a very sharp knife to chop them. 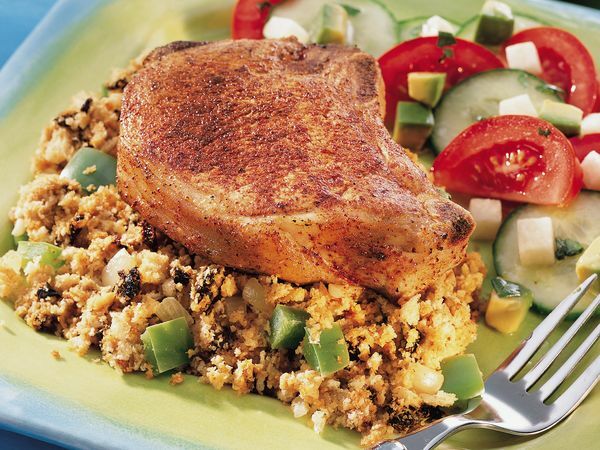 Serve this chops and stuffing combo with a tomato and cucumber salad. Add diced jicama and avocado and toss the salad with a lime vinaigrette. Sprinkle the salad with chili powder and chopped fresh cilantro.